A Birthday surprise that’s gone viral have your Kleenex handy! Lumo made his daddy very happy! Over 10 million hits on facebook! 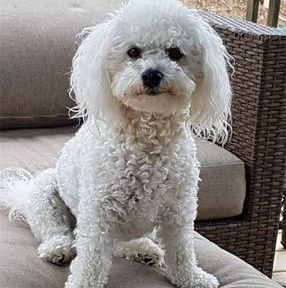 You can’t imagine how much joy it brings us that the puppies our girls produce at Bichon Lovers help people to feel really amazing. OMG how touching!❤❤Two years ago Today…Nov. 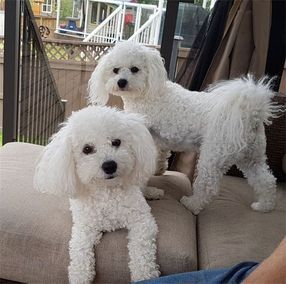 15th, 2015 we felt the same way when we met you, David, Simona & Bichon Family to adopt our beloved Bella & Ciara❤❤Ken & I were re-living our epic 5 day journey to Langton all week…we left Calgary on Nov. 10th…Adoption was noon on the 15th; then Dixie, Twins & us drove home to arrive in Calgary November 20th! !WHATTA LIFE CHANGING JOURNEY!! ❤❤ ONE WE REMEMBER & CHERISH EVERY DAY! !YOU GUYS ARE SIMPLY INCREDIBLY AMAZING PEOPLE❤❤❤❤❤❤!STILL BRINGING LOVE & JOY TO COUNTLESS PEOPLE ….. WHAT A LEGACY YOU’VE CREATED!!! !Grooming tomorrow…will send updated pics to you of the girls!